Rhubarb, one of spring’s most anticipated vegetables. Yes, rhubarb is actually a vegetable, even though we all consider it a fruit. There’s your first rhubarb fact of the day! 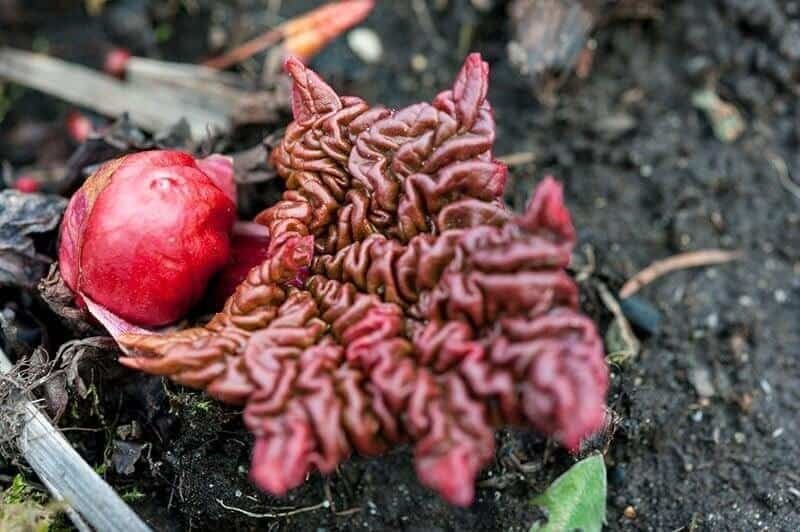 Read on to find out more about one of the most sour ingredients that we cook and bake with – how to grow rhubarb, how to cook with rhubarb and a bunch of rhubarb recipes! Rhubarb looks like a vegetable ( celery stalks, anyone? ), but acts like a fruit – or rather we treat it as a fruit. Rhubarb is an perennial plant that comes up every spring, usually bigger and better than the previous year, making it a favourite of gardeners – it’s almost impossible to kill, it requires almost NO intervention or care and gets better every year. If only all plants were like that! Rhubarb is sold in stores and farmers markets in stalks like celery. The leaves of rhubarb are poisonous and aren’t edible for humans, pets OR stock animals! Many an animal has been poisoned from rhubarb leaves, so please take care when adding it to your yard or garden. My dog won’t even eat scraps from the floor, so he wouldn’t touch rhubarb leaves with a ten-foot pole, so I have two in my flower beds. Chose a location that is well-drained, fertile and in a sunny location. Now that I told you what the experts say about planting rhubarb – honest to the Good Lord above you guys, I have never killed a rhubarb. I have grown in in the worst soil ever. It has grown in a terrible, sandy garden at my parent’s old acreage. I have forgotten to water it for weeks. Rhubarb is a weed, I swear. 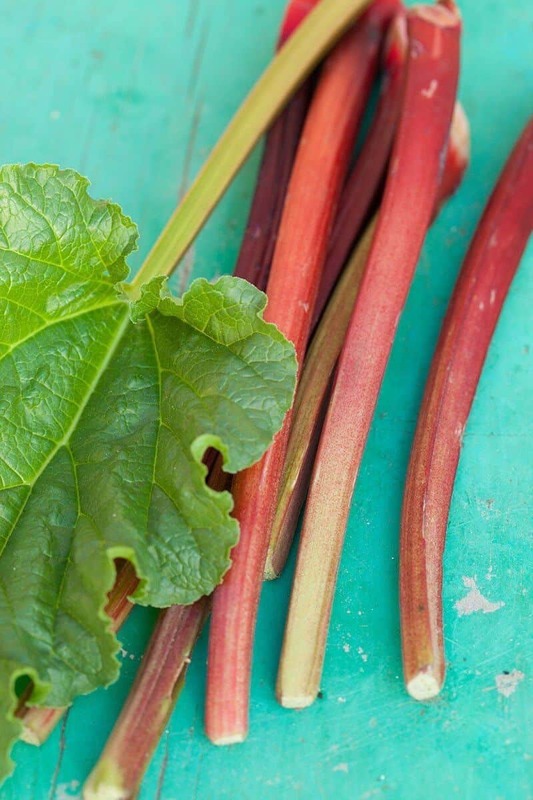 If you are wanting a red rhubarb variety try to look for ‘Valentine’, ‘Crimson Cherry’, and ‘Canada Red’. The green rhubarbs taste just fine, but the red stalked ones can be slightly more tender. You will most likely have purchased a rhubarb crown, which means that there are no leaves or very few. You are going to want to dig a large hole, twice the size of the crown. If you really want to make sure it grows, mix in compost and other rich organic material and backfill the hole slightly with it. Plant the crown and make sure that the roots are 1-2 inches below the surface. Mulch around the plant to keep weeds down if wanted and to keep the moisture in. Water the rhubarb well during the hot summer months. When you see a seed pod/flowering stalk, remove it right away! Those pods draw energy away from the plant growing stalks that you want to eat, resulting in rubbery stalks instead of firm ones. You can split your rhubarb every 3-4 years, just make sure to do it when the plant is dormant in the fall. I would say spring but we have snow too long into spring, and then our rhubarb is instantly out! When do I Harvest Rhubarb? If you want to start your rhubarb out right, resist the temptation to harvest it in it’s first year. The stalk are spindly and won’t be as good as they will be the next year, but you really do need to let it grow for a year and leave it. Trust me, the rhubarb will be a monster next year! Harvest will last from 8-10 weeks but this depends on your climate as well. The best way to harvest it is to use a sharp knife at the base of the stalk and cut it off, twisting can pull at the base too much. You want to make sure to leave 3-4 stalks of rhubarb on your plant for the year, don’t cut them all off, this helps ensure continued stalk production. You want to use rhubarb before it’s at it’s full maturity, as they tend to start to get softer the older the stalks are. You need to look for stalks that are firm, crisp and free from blemishes (if you are buying them, if you have them in your yard just cut those blemishes out, don’t waste them!). The younger stalks are going to have smaller leaves, so when you see those huge fans of leaves those are the older stalks – still edible but try to use those first before they get too old! The older rhubarb also becomes stringy and tough and doesn’t cook up as well, so do try to make sure you harvest them early on. Rhubarb is primarily paired with sugar to sweeten it up and used in desserts and is almost exclusively paired with strawberries. Yes, there are other fruits paired with it, but the most anticipated flavour combination of spring is strawberries and rhubarb – and for good reason, they are both springtime produce. The flavour profile is extremely tart, with a fruity taste, thus why we treat it as a fruit more often than not. It’s a common misconception that rhubarb needs to be pink or red to be ripe, there are rhubarb varieties that are entirely green and completely fine to use. If you are looking for colour in your dishes, try to make sure that you get a variety that is pink or red. Rhubarb does not hold it’s shape when it’s cooked, so it’s usually made into pie fillings. sauces, cake toppings, the works. 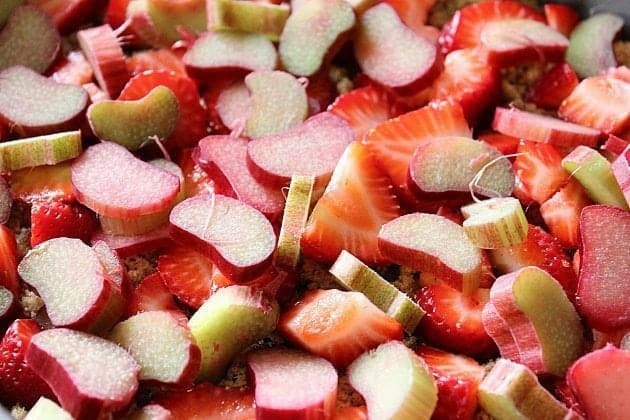 Here’s a list of some tried and tested, completely delicious rhubarb recipes. I have combined rhubarb with more than just strawberries as you can see, but strawberries are still my favourite! Happy gardening! Who has rhubarb growing in the garden this spring? What have you made so far? Pin This To Your GARDENING Board and Remember to FOLLOW ME ON PINTEREST! Any way I can grow rhubarb in SW Florida? I Love rhubarb but am told rhubarb needs cold winters to be dormant? Would love to somehow grow some!!! I’m embarrassed to say I killed my rhubarb plant. After many years of no problems and awesome production, it started turning red last year, looked like it got some disease of some sort. Dug it up, tossed it and planted new this year! Oh no! That’s crappy! I googled it and apparently it’s called Red Leaf and yup it kills the plant, nothing can be done. What about rhubarb jelly!!! Great on toast. 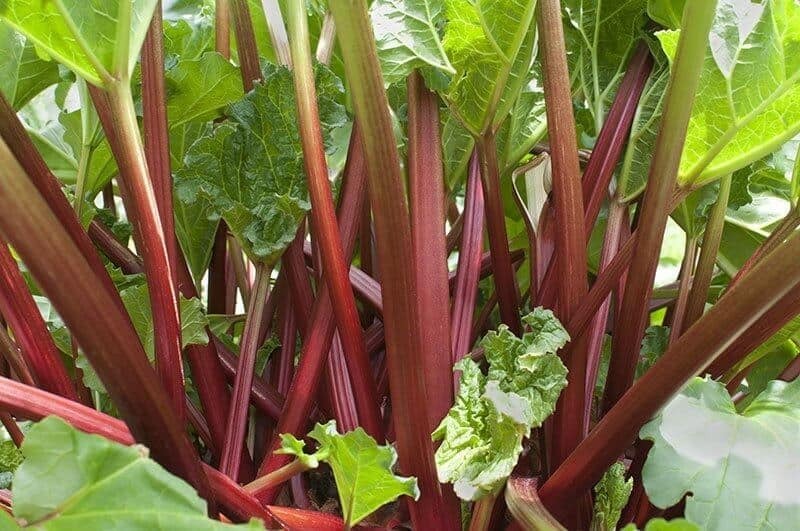 One of my favourite memories is sitting beside the rhubarb patch with a bowl of sugar to dip the stalk in and pig out. I need to make some jelly/jam this year! Rhubarb simple syrup is amazing!